Charlie Brown is befuddled, Sally is mad, Schroeder is intense, Snoopy is cool and Lucy — well, Lucy is just plain Lucy. Snoopy (Isaac O’Farrell) and the Woodstocks are part of the Peanuts fun. Whether you’re a big fan of Charles M. Schulz’ Peanuts characters or just meeting them for the first time, you’re sure to find them captivating in Ethington Theatre’s “You’re a Good Man, Charlie Brown,” which opens today at 7:30 p.m.
Tonight’s production is sold out and tickets are selling fast for remaining shows because of the sizzle generated by the singing-and-dancing romp performed by actors whose sheer delight in playing their roles shows in every facial expression and line. “For me, the Peanuts comic strips were a huge part of my childhood and upbringing, and for Charles M. Schulz to have kept it going for 60 years — and be able to connect generation to generation — is amazing,” said Scott Campell, the director. 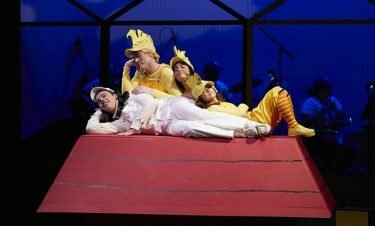 “You’re a Good Man, Charlie Brown” opens today at Ethington Theatre. 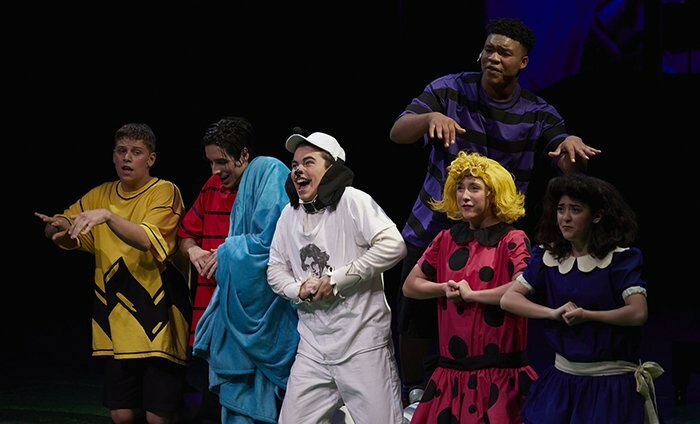 Spot-on costumes, over-the-top hair and make-up and oversized props and furniture help create the impression that these college actors are 5-year-old cartoon characters. But it is the acting itself that completes the illusion, convincing audience members that they are watching one of the most beloved and iconic groups of 5-year-olds of all time. 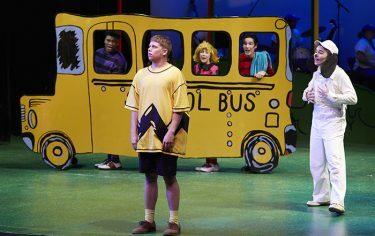 Charlie Brown (Micah Larsen), who wears a perplexed look most of the time, is clad in an oversized yellow shirt with black zigzag, a pair of shorts and suede saddle shoes. The show’s central theme answers Charlie Brown’s question about whether he is, in fact, a good man (you can guess the final determination). “I’m not bad, I’m not good, I’m sort of in between,” he said. But the show is also an uplifting spectacle filled with foot-stomping, smile-inducing musical numbers performed with endearing enthusiasm. The musicians, led by Music Director Mark Fearey, played their instruments so closely to the cartoon that they were almost like another character. “My Blanket and Me,” a song about the attachment that Linus (Bowen Moreno) has for his blanket, is a masterpiece of musical tradition in which the blanket becomes a horse, a baton, a dance partner and a romantic figure. “I love you, I love you, I love you,” Linus says to his blanket. Side-slapping vignettes are also performed throughout the entertaining spectacle. Lucy (Tarnim Bybee) declares that she is the queen while Linus (Bowen Moreno) seeks comfort on an oversized couch. O’Farrell’s Snoopy depicts a brilliant fighter pilot as he sits atop the extra large red dog house-turned-plane. His arms shake as if he is in fact steering a vibrating, high-powered aircraft as he battles the Red Baron. Sally’s rendition of “My New Philosophy” is made especially sweet by soprano Whitney Hammond, who played the character Thursday night (the part is double cast with McKenna Kollman). Sally clenches her fists and hunches her shoulders when angry – clearly depicting a 5-year-old having a fit. “I’m mad at everything in the whole world!” she yells in one scene. 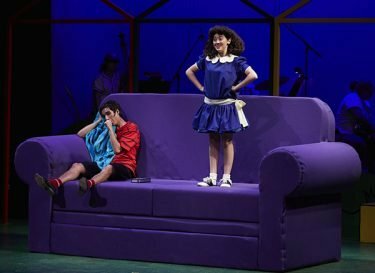 Lucy van Pelt, played Thursday by Tarnin Bybee (the part is double cast with Ali Giordano) performs the loud, obnoxious role to a T. She stomps, declares herself queen, steals Linus’ blanket, mercilessly teases Charlie Brown and lingers over Schroeder’s piano. At one point, she takes a survey – of herself. The Peanuts characters, wearing over-sized hats and giant foam gloves, are also a baseball team – and Charlie Brown is the pitcher. “All right, Charlie Brown, we’re all behind you — sort of!” Lucy says. Trustin Adams, who played Schroeder on Thursday night (the part is double cast with Christian Bradford) dyed his hair bright yellow and curled it for the role. He scowls at Lucy’s questions, and when he plays the piano, his neck burrows between his shoulders and his hands rise up as he forcefully plays. 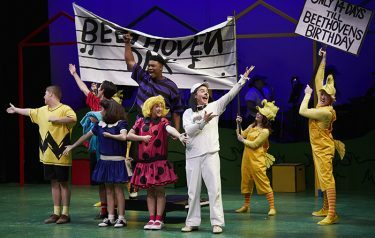 Despite all the comedic setbacks, Charlie Brown learns the true meaning of happiness, and the cast sings one of the most dramatic songs of the night. Tickets can be purchased here or at Groupon. Students get in free with ID.